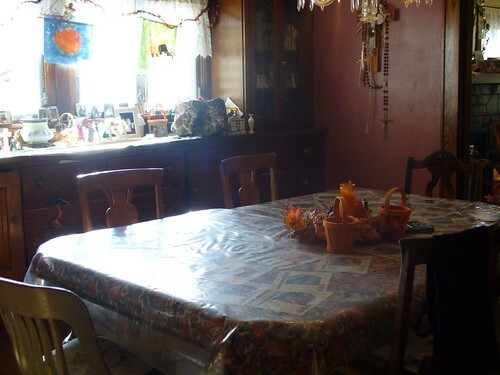 All of my previous posts and pictures about All Saints Day/Halloween can be found via my del.icio.us links here. Some Christian blogs and even some Catholic forums have been vacillating about whether or not it is right to celebrate Halloween. My answer to that is absolutely it's okay to celebrate! as long as you understand exactly what it is that you are celebrating! There is really no historical connection between the setting of this feast to November 1 (naturally placing the Eve to October 31), and the Pagan Celebration of Samhain other than Pope Boniface moved the feast to the same time of year when Samhain is celebrated. But I like to look at it another way. The change of seasons and the harvest are gifts from God, even if the ancient Celts didn't quite see it that way, and as the scriptures say, "Test everything. Hold on to the good," and Finally, brethren, whatever is true, whatever is honorable, whatever is right, whatever is pure, whatever is lovely, whatever is of good repute, if there is any excellence and if anything worthy of praise, dwell on these things. Christians have long honored the martyrs who have died for the faith and the Christian aspect of this feast day comes from 4th Century on as All Martyrs Day. It use to be observed the first Sunday after Pentecost and then it eventually came to include all of the saints known and unknown and the feast was set for November 1, making the vigil of course All Hallows Even, October 31. The Feast of All Saints is one of the greatest of all feasts because it celebrates what could have been impossible. The cross is a tree that bears fruit. This is the feast of its harvest. The celebrations of the mysteries in the life of Our Lord are glorious and there is no detracting from them. But he was God. This day we celebrate the perfecting or human nature by grace pouring form the side of Christ on the cross, through His Church and His sacraments, remaking men after their despoiling in the Garden. Aside from all the lofty things to be said about the saints and to the saints on this day, we want our children to understand in the marrow of their bones what the principal idea is: "We are so glad for you. Now pray, so we'll be there too!" And they must add to this and to every feast and endless: "Thank you, Lord Jesus, for making it possible." 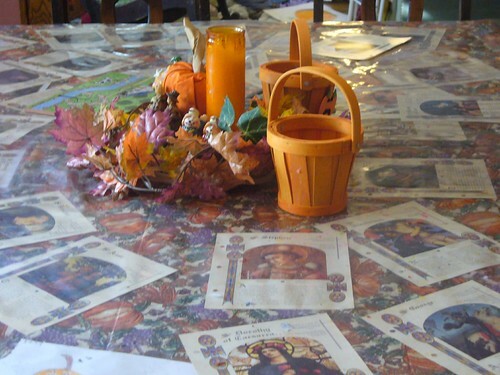 For the Catholic family I believe preparing children for All Saints Day really is a year-long activity. Our liturgical calendar is full of feast days all year round and it is important to remember and acknowledge these events as they happen throughout the liturgical year. Parents should take the time and the opportunity for just a few minutes each day to educate our children about the holy men and women who have become saints. 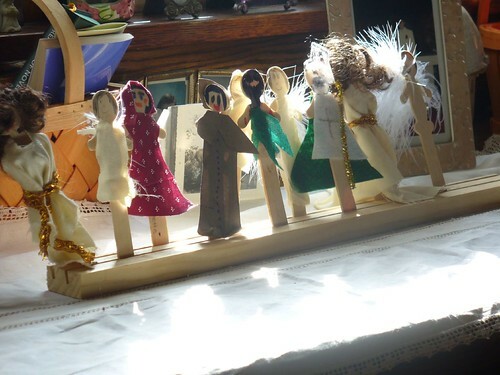 This year I was inspired by Cottage Blessing's Spoon saints and so we tried to make a spoon saint for each saint that we talked about in depth during the year. Before Halloween I hope to have the children add each of the saints that they are portraying this year to our collection. I have several tools that help me keep on top of the liturgical year. Of course I use the links from Universalis on my blog, as well as Saint of the Day from American Catholic. I also use this lovely Catholic Woman's Planner, and have a calendar from the Shrine of the Immaculate Conception up on my wall. With these tools I can see and plan for the liturgical year, all of the feasts and commemorations, almost effortlessly. Most days we read something about the saint for the day and we ask that saint to, "Pray for Us" after our prayer before meals. During the year, I like to read more about the saints to the children. I particularly like, 57 Stories of Saints, by the Daughters of St. Paul, the Picture Book of Saints by Father Lovasik. A new treasure for me last year was is Father Phillip Tells a Ghost Story, from Adoremus Books (HT to the Happy Catholic for writing about this.) This really does a nice job of incorporating the other connection with ghosts and the dead with their proper place in Catholic life with prayers for the dead and purgatory. Throughout the year I try to encourage my children to choose which saint they would like to be for All Saints Day and then we decide about costumes. work on costumes. I have had a lot of success in the past with Simplicity Pattern 4797 Bible characters are easier to make because you don't require a lot of extra detailing or fitting. Please see my past links for examples of our costumes and how I made them. Perhaps the easiest costumes we have made were the archangels. I had my boys wear white sweat pants and sweat shirts and just put the wings on their back. Gabriel had a trumpet, the Archangel Raphael carried a plastic fish and St. Michael had a breast plate and a sword! Another favorite was John the Baptist. I took white long johns and died them brown and then made a tunic from fake fur. A wild wig added to John's rustic look and he also carried a honey jar and some fake books (John ate wild honey and locusts. A simple tunic with a set of keys and you have St. Peter! A block of wood with some holes to stick arrows in, hidden under a tunic and you have St. Sebastian! Martyrs are lots of fun and little boys like them because you can use lots of fake blood and that seems to appeal to their sense of gore that goes with Halloween. Calvin once appealed to his sense of comedy by stuffing himself with pillows and a skull cap, which we glued fuzzy hair to, so that he could portray Thomas Aquinas! He carried a big old fashioned Ledger book as his Summa. I'm to a point now that I have A LOT of boy's costumes in our costume box. Gabriel wears a black medieval frock that I bought for a a buck at our local community center's yard sale . With that he has been Saint Isaac Joques and Father Damien the Leper. 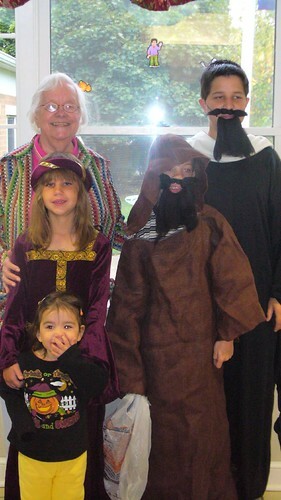 This year we added a beard and voila - St. Ignatius Loyola! 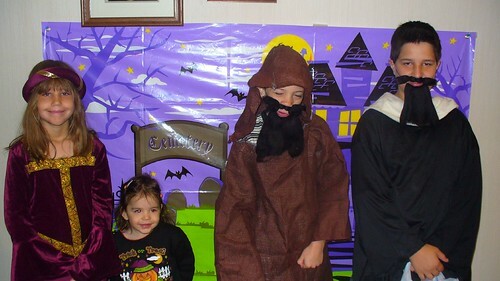 For Noah we added a beard to our St. Francis robe and we had an instant St. Anthony of Egypt the Hermit. I bought a costume for Isadora last year and we are getting lots of use to it. It too is a medieval costume so we go down the list of medieval female saints and she chooses from that. An addition bonus is that she will get to wear it for the Medieval feast that the community center throws every other year and of course if we take good care of it, Rosie can wear it in the future too! The kids with Grandma for the Halloween Brunch! Izzy as an angel, and Rosie as St. Kateri. I use cards from a collection called Ordinary People, Extraordinary Lives. I can't find that available anywhere on the net. Old holy cards or other pictures you can find and save on the net also work very well. 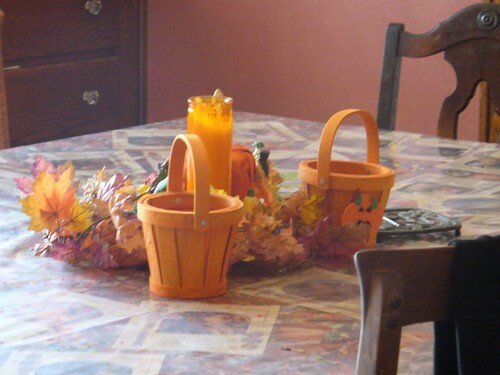 For us I put them on the table cloth and cover them with a plastic covering, that way the kids can talk about them during meals. I also put up some of the children's other holiday art including pumpkins and spiders! All Hallows Eve, All Saints Day and All Souls Day are a wonderful Christian time of the year. 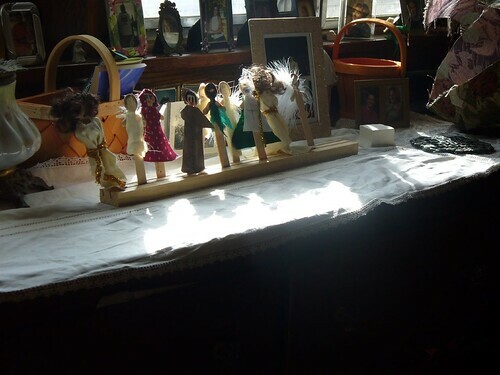 With a little thought and creativity it can make wonderful memories for families and provide our children with more education about their Catholic faith and Christian heritage as well as deepening their faith. Women for Faith and Family. A great article by Scott Richert here.